Even at first sight, a smart thermostat really looks cool. Aside from its clear digital display, you will also enjoy other high-tech features that it offers. For smart homes and homeowners, investing in smart thermostats in one of the best decisions they could do for energy savings, greater convenience, and better comfort control. If you haven’t got a smart thermostat for your home today, here are five (5) brilliant reasons why you should get one. It is true that conventional thermostats work great – only if you are around to adjust them. You may struggle with modifying the settings if they are not within your reach. The good thing about smart thermostats is that you can change the settings from anywhere with your smartphone, tablet or any smart devices. You can use a web browser or your thermostat’s mobile app to control and monitor your home’s temperature. Similar to many smart devices, a smart thermostat also responds to voice commands. By installing virtual assistant software to your device, you can control your thermostat without the need to scroll your phone. A voice-controlled thermostat may be an expensive investment, but it is surely worth every penny. One of the selling points of smart thermostats is automatic temperature control. It records and learns your preferred temperature settings. It creates a schedule on its own based on the data recorded. What is more surprising is that it can learn your family’s profile and identify if a family member is at home or away at specific times. By installing sensors in various areas of the house, your smart thermostat will know if you are in or out. You can place the sensor in the individual rooms to save energy costs while your HVAC system is running. The sensors will send data to the thermostat if the room is occupied or not and adjust your house’s entire temperature automatically. Aside from convenience and accessibility, you will also benefit from greater energy savings with smart thermostats. With all its learning and automation functions, it can cut your energy costs in half. If you want a perfectly comfortable home, investing in smart thermostats is definitely beneficial. 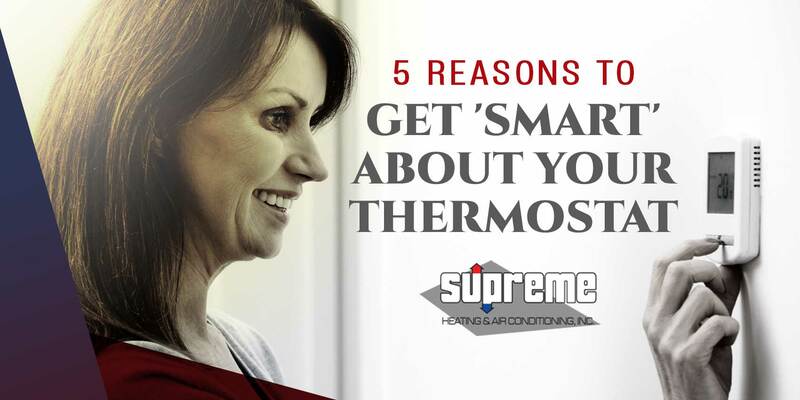 Call our experts at Supreme Heating & Air Conditioning, Inc., to help you find the best smart thermostat fit for your home and comfort needs.